The NS was an important bus in the development of the London double-decker. Although very much the last throw of a generation, it was used as a trial platform for many of the advances that would come with the new generation at the start of the thirties. As initially produced it was a product of the restrictive thinking of the Metropolitan Police as regards buses. Dimensions and weight were severely restricted, a top cover was not permitted (although the General wanted one), there was no windscreen and solid tyres restricted the top speed to 12mph. But during production these restrictions were gradually relaxed, and by the end of service most had roofs, pneumatic tyres (allowing a top speed of 20mph! ), and even wind-screens. Progress indeed! NS1 was produced in 1922. It had a detachable roof in order to test the waters with the Public Carriage Office. Most importantly in terms of bus design it had a cranked chassis that allowed the passenger saloon floor level to be substantially lower compared with its predecessor, the S class. Just a single step of 13in took passengers up onto the platform, compared with 3 steps and 25in for the S. It was this lowering of height that allowed the General to hope that a top cover would be permitted. But no, it was not to be. 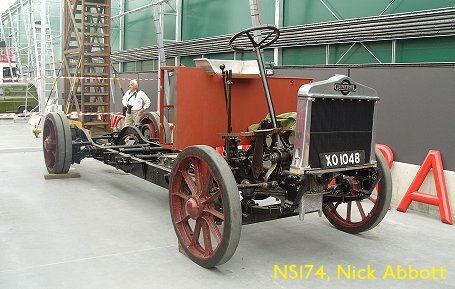 NS1 was withdrawn after approval was not received in early 1923, the chassis not reappearing until July under a standard body. NS2 was a development chassis delivered in January 1923, fitted with a lorry body and sent to the Experimental Department at Farm Lane. It was fitted with a standard body, and registered as a bus, in May 1924. NS3 and NS4 were not delivered by AEC until August 1923, so also had late registtrations. LGOC showed its faith in its new product by ordering another 850 straight off, quickly followed by repeat orders for another 500, then another 250. 975 open-top bodies were ordered from Short Bros of Rochester, 185 from Brush, 100 from Ransomes Sims and Jeffries, and 365 by LGOC at Chiswick. That left 25 spare bodies for overhaul purposes. The buses had 35hp 4-cylinder motors, driving through a wet clutch and a variety of different gearboxes (including constant mesh and chain types) to a double-reduction rear axle. Wheelbase was 15ft 6in. Laden weight was an amazing 8 tons 7cwt. The body work had four and a half bays: the four main bays had hopper ventilators, the upper window on the half-bay being used to display the route number. Early buses had a large route number stencil fitted to the front of the driver's canopy, with a broad, hinged two or three-line route board above the canopy, with a detachable final destination board at the top. Drivers sat very high under the canopy, but had no windscreen. Livery was standard General red and white. The NS was put into full service in May 1923, twenty-two starting together on the prestigious route 11 that passed Whitehall and Fleet Street on its way from Shepherds Bush to Liverpool Street. Hammersmith was the happy garage. A further twenty-six arrived at Hammersmith later the same month. They displaced S types, which were cascaded to replace still older types, resulting in the demise of many B-types.. Next garage was Mortlake, which employed them on the 9 and 73, then Tottenham for the 29 and 73. Palmers Green, Battersea and Chalk Farm received them for the 29 too. Next came Seven Kings for the 25 and 25A. Forest Gate, Holloway and Enfield were also early recipients, and Norwood, Middle Row and Merton. Putney Bridge, Dalston and Hackney followed on, then Loughton, Leyton and Putney. Willesden and Upton Park received sizeable allocations. Barking, Cricklewood and Camberwell received a share, plus Hendon, then Old Kent Road and Streatham. Turnham Green got some too. Fifteen were supplied by LGOC to National Omnibus in early 1924 for northern area services N2, N3 and N10. These were numbered in the main LGOC series, as they were owned by the General, but had Hertfordshire registrations and National fleetnames. Livery was standard red and white. 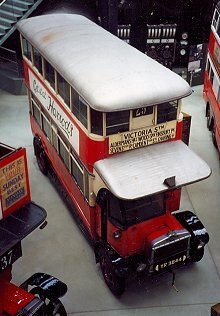 Whereas the buses up to NS1605 had used chassis supplied by AEC from Walthamstow, the next batch of 132, from September 1924 (as well as subsequent batches), had their chassis built up by LGOC themselves from AEC parts. Standard open-top bodies by Short Bros were fitted. Three were supplied to National, and ten to East Surrey, all owned by LGOC and numbered in the main sequence. The Country buses continued to be used on the less hilly routes, the alternative, more powerful PS type being used on the North Downs and Chilterns. Other bus companies around the country were managing to convince their powers-that-were to allow roofs on buses. AEC had even supplied a closed-top NS to Argentina. LGOC decided to try again. NS1734 to 1737 were fitted with closed-top bodies, and an approach made to the Metropolitan Police for permission to run on route 21. This was refused after a trial run with NS1734, because of overhanging trees and lamp standards between Eltham and Farningham. But a trial was authorised on route 100, which connected Epping and Elephant & Castle via a mix of country, suburban and City streets. The four buses went into service from Loughton in October 1925. The experiment was deemed a success. NS 1738 was not really an NS at all. It was more or les an ADC419 coach fitted with an NS engine. It was used for private hire work. In 1925 East Surrey bought eight NS type buses in its own right - ie not owned by the LGOC. These used AEC chassis from Southall, and Short Bros, 50-seater open-top bodies. Like the General-owned buses on loan, they carried East Surrey's current red and white livery with East Surrey fleetnames. The radiator cast badges said AEC rather than General. They were used on the less hilly busy routes, such as the 408 between Guildford and Leatherhead. When pneumatic tyres were allowed in 1928 they were rapidly converted, the raising of the speed limit from 12mph to 20 mph affording a terrific boost to route capacity. LGOC ordered another 200 NS types, with chassis built by themselves and with roofed bodies. Fifty bodies came from Shorts, one hundred and fifty from Chiswick. As it happened, the bodies were ready before the chassis, so fourteen were mounted on older chassis that had come in for overhaul. That meant that the final fourteen of the batch were fitted with overhauled open-top bodies when they went into service at Forest Gate and Putney Bridge. The closed-top buses, perhaps inevitably, went first to Hammersmith for the 11, followed by Tottenham for the 29, 76 and 176, Seven Kings took them for the 25 group of routes, and Dalston for the 9, 11 and 8. The remainder went to other garages, and the displaced open-top NSs spread across the system. LGOC also ordered another fourteen open-top buses for Country use, three to National and eleven to East Surrey. These, intended to be NS 1939-1952, were built first, and were placed on NS1739-43, 1747, 1750, 1752-3, 1756-8, 1761 and 1764. NS1995 is part of the London Transport Museum collection. In 1998 it was in the Museum in Covent Garden. It shows a late form of the class, being fitted with a closed top body, pneumatic tyres, a windscreen cab and London Transport fleetnames. Another 341 closed top NS types followed in 1926-27, including some variety. The majority were fitted with closed-top bodies with a lighter structure of roof than the earlier variety. The number also included two secondhand chassis: NS1953 came from Hull & District, and NS2231 from Mr Antichon of Yorkshire, who had used it as a single-decker. Both were fitted by the LGOC with standard closed-top bodies. As well as these new buses, many of the earlier bodies were fitted with roofs at overhaul. Strangely, seating capacity was increased by 2 on the buses with roofs. Another element of variety was the tunnel bus. NS2050 was specially designed to work on route 108 through the Blackwall Tunnel, which not only had a restricted circular bore, but sharp bends as well. The special body was even narrower than the normal 7ft 2in allowed so far for the type. It also had an enclosed staircase in a very rounded rear end to take account of the bends. It was lower too: seating on the upper deck was a pair of outward facing longitudinal benches, with access by footwells intruding into the saloon roofspace. The centre of the lower saloon was higher by intruding up below the central upstairs seating. Downstairs the seating was inward-facing. Total seating was 22 up, 24 down, still substantially more than the thirty on the S-type single deckers. The roof was deeply domed. NS2050 went into service on the 108 between Bromley-by-Bow and Forest Hill in April 1927, operating from Athol Street garage, Poplar. Another twenty-four similar buses, but with 20 diagonal bucket seats upstairs, followed in October 1927, displacing S-type single-deckers. These retained solid tyres beyond most of the rest of the class because of the constant rubbing against the tunnel kerbs. The Tilling and British Automobile Traction Co was a London operator in association with the General. They operated 33 buses from a garage in Rochester Mews, Camden Town (AQ). They ran on route 24 (Hampstead Heath to Pimlico) and, on Sundays, on route 63 (Hampstead Heath - Honor Oak). Livery was a dark olive green, with British fleetnames. Birch built 33 standard-style covered top bodies for NS chassis in 1927, which were numbered 501 to 533. These later became NS2379 to NS2411 when taken over by London Transport in 1933, still solid-tyred. 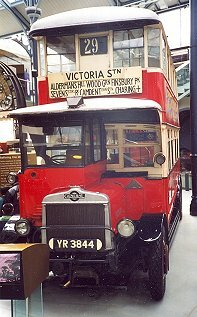 LGOC operated some services on behalf of Tramways (MET)-Omnibus Co.Ltd., maintaining their vehicles in standard livery but with Metropolitan fleetnames. Some twenty-one of the NS open-top fleet were allocated to Metropolitan in December 1927, to work on new route 288, which featured bridges too low for the S-types displaced from predecessor route 88A. Seventy more NSs joined the Metroplitan fleet in early 1928, this time covered-top buses from Dalston and Willesden garages operating on routes 8 and 150. East Surrey also bought a ADC 422 type NS in 1929: MP1460 was an AEC demonstrator, and was fitted with an open-top body. It became NS2378 afer the LPTB takeover. The main advantages of pneumatic tyres from an operator's point of view was obvious: the legal top speed was 20mph as against 12mph for solids. This allowed either a headway reduction with the same size fleet, or a maintenance of capacity with a smaller fleet of buses and crews. A better ride and more control were bonuses. Double pneumatic tyres on the back increased the width of an older NS to 7ft 4in, outwith the old regulations but allowed by the new. So as buses went through overhaul many were fitted with pneumatic tyres on the appropriate wheels. Not all: the replacement programme stalled as the NS buses began to be replaced by newer types. But all the "country" buses operated by National and East Surrey were converted early, during 1928, as their longer runs produced more benefits. Likewise longer suburban routes received the pneumatic tyres soonest in the LGOC area. The British fleet stayed on solids. So did the tunnel fleet. Putney Chelverton Road garage was too low to accommodate pneumatic-tyred buses, so retained a fleet of solid-tyred buses until July 1935. Windscreens for the drivers eventually made an appearance too, as the Metropolitan Police began to see that letting drivers be covered with rain, snow, flies and dirt was not essential to maintaining their concentration, and that opening windscreens could be fitted that could be cleaned. A first attempt was made on NS198 in March 1929, with a simple glass apron screen, without much joy. A further attempt in August and September 1929 involved three NS, with a wider cab structure. These too did not prosper. But from 1931 a proper glazed cab began to be retro-fitted to the NS class - with an open doorway, of course. In January 1932 East Surrey had been subsumed with the London General Country Services, the buses being officially conveyed in April. In subsequent rationalisations Crayford garage relinquished routes 407 and 411, which operated into Sidcup, which were transferred to Sidcup garage. With the takeover went East Surrey 161, 164 and 166, which were given "missing" numbers NS2348, 2349 and 2347 respectively. Three other ex-East Surrey buses - but owned by LGOC, went with them. 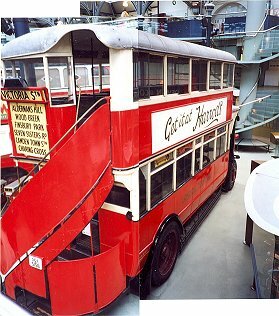 In 1932-1933 some of the Central Area buses reverted to open-top - or gained open-top bodies - at overhaul. These were in addition to those that had been retained in open-top form because of route requirements or low garages (Old Kent Road and Chelverton Road). The new open-toppers formed a Special Events fleet, being especially in demand on Derby day, when they werwe used as grandstands at Epsom Racecourse. On the other hand, the London General Country Services, formed in April 1932 to encompass East Surrey and National operations, put tops on some of its NSs, especially for routes 303 and 405. Whether they were swaps from the LGOC from the Special Events fleet I do not know, but it seems likely. LGCS adopted green livery too, replacing the red & white of East Surrey and National. When the London Passenger Transport Board took over in 1933 there were still substantial numbers of NS buses running. Only 183 of the LGOC buses had been withdrawn. LPTB took over not just the LGOC and LGCS fleets but the Tilling and BAT fleet too: the BAT buses, still all solid tyred were numbered NS2379 to NS2411. They were repainted red, but were all withdrawn by October 1934. LT set about disposing of the NS fleet as fast as it could replace them with Renowns and Regents. It concentrated on the open-top fleet and the solid-tyred examples first, although Old Kent Road had to keep open-toppers due to a low roof, until April 1934, and Chelverton Road had to keep solids until July 1935 for a similar reason. An experiment with reinforced pneumatic tyres on a tunnel bus (NS2213) in 1935 successfully paved the way for their replacement with the tunnel STLs in April 1937. The last solid tyre in normal service had rolled. The last NS to run in normal service was NS1974, which ran from Aldwych to Bank on peak hour route 166 on 30th November 1937. After withdrawal not a few NS buses were converted for Service Vehicle use. Twelve became mobile staff canteens (NS173, 250, 289, 429, 577, 931, 1120, 1698, 1722, 2169, 2295, 2322). The impetus was the Coronation of King George VI in 1937, when many buses were expected to be turned short of the Central Area, thus missing the usual staff refreshment locations. In the event, of course, the bus crews were largely on strike on the day anyway. But the twelve were commissioned and fulfilled a useful role at many locations such as Finsbury Park Station, Vauxhall Cross, Chingford (R.F.H.) and Hampton Court. During the war they provided service where garage facities had been rendered unusable. They lasted to the late forties/early fifties, some working alongside the replacement post-war ST canteens and the trailer canteens. The first converted, NS289 was rebuilt as a single-decker canteen. The canteens had a kitchen forward downstairs, and a fuel tank underneath. Crew seating accommodation was upstairs, except in 31H of course. Livery was various, mostly being variations on red, white and black, in various proportions. The twelve initially kept their bus numbers, (although officially known as Mobile Staff Canteens 1-12) then were renumbered into the service vehicle series in 1939 as 29H-40H in the same order as their bus numbers. One (NS760) became a trolley wire lubricator, providing a film of graphite to lubricate the passage of trolley collectors along the conductor wire. It was fitted with a tall open-top body with an internal staircase and double doors at the back. A pair of sprung collectors - actually lubricators - made it look like a hybrid trolleybus. These were fitted with spotlights to illuminate the conductor wires as the work was done. An extra high widow above the cab allowed the driver to see the wires that he was following. The bus was in the Trams & Trolleybuses department, so sported a number in their series - 203 - and trolleybus livery of red with a black-rimmed cream waist-band. In 1939 it was renumbered as 41H. It was joined in 1938 by a rebuilt Regal coach (114W), but succumbed to German bombing in October 1940. Four became tree loppers. The push to convert routes to double-decker operation in the late thirties, especially as war materials production was stepped up in the areas outside London, required many more routes to be cleared of overhanging tree branches. The existing tree-lopper, specially-built S384, could not cope with the demand, so four redundant NS buses (NS556, 1653, 1684, 2193) were converted in 1936-37. Conversion was straightforward: the top was cut off a double-decker, leaving just the stumps of the window frames showing. It was then given a coat of Chiswick Green. Unlike the post-war conversions, the downstairs windows seem to have been left unpainted. One, NS1653, was sold in 1938 so was not included in the 1939 renumbering, when the other three became 42-44H. One bus chassis (NS1200) became an internal towing "lorry" at Chiswick Works. 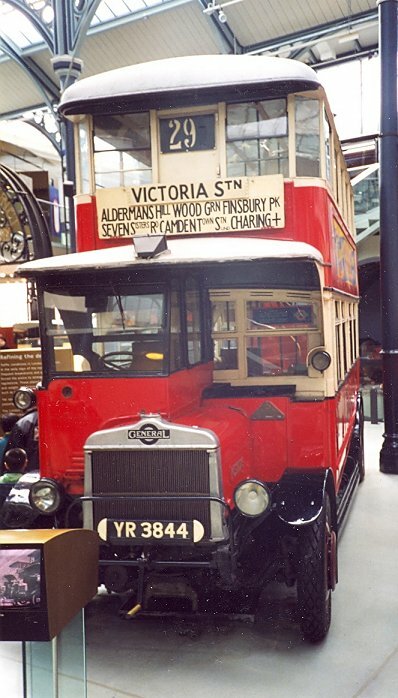 Unregistered, but given the fleet number 338H, it hauled buses around the works as required until scrapped in 1949 and replaced by bits of STs ("ST314"). NS1995 was allocated to the Museum Stock, and at the time of writing is in the London Transport Museum collection at Acton, making occasional road appearances. Various NS chassis have survived. The London Bus Preservation Trust has several under its wing, including NS 174, which has been overhauled and awaits a replica body, NS1414, NS1849 and probably NS2405.